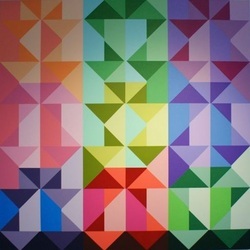 Shannon Novak is an emerging artist who resides in Auckland, New Zealand. His pre-occupation is Geometric Abstraction as set down by the likes of Malevich and Mondrian, both of whom initially made their mark in the second decade of the 20th century. Novak is devoted to using geometric forms to represent his deep and abiding interest in the interrelationships between sound, colour, form, time, space, and social context. Novak’s exploration began when the artist became a pianist at an early age taking his cues from both classical and modern schools of music and later composing and performing his own musical works. Education has played a prominent part in the artist’s life. Novak worked as an Instructional Designer for a number of years designing instruction manuals on a range of topics for a variety of organisations. These incorporated graphic elements such as detailed technical drawings and diagrams that translated abstract concepts into easy to understand visuals. Academically, the artist was awarded the Master of Education degree with first class honours from Massey University in 2009. The sum of experiences gained through both his working and academic career has had significant impact on the direction and motivation behind his artistic career. Novak treats exhibitions as opportunities to provide individuals with ‘learning experiences’ optimised by works that use instantly recognisable shapes and colour.